Plants do not have great demands for gaseous exchange. The rate of respiration in plants is much lower than in animals. Large amounts of gases are exchanged only during photosynthesis, and leaves are well equipped for that. The distance travelled by gases in plants is not much and hence diffusion is enough to meet the need. Hence, plants do not have specialized organs for exchange of gases. Lenticels and stomata serve as the openings through which exchange of gases takes place in plants. The complete combustion of glucose yields energy during respiration. Most of the energy produced during respiration is given out as heat. CO2 and H2O are the end products of respiration. The energy produced during respiration is also used for synthesizing other molecules. To ensure adequate supply of energy for synthesis of different molecules; plants catabolise the glucose molecule in such a way that not all the liberated energy goes out as heat. Glucose is oxidized in several small steps. Some steps are large enough to ensure that the released energy can be coupled with ATP synthesis. Respiration happens in two main steps in all living beings, viz. glycolysis and processing of pyruvate. Glycolysis involves breaking down glucose into pyruvate. This is common in all living beings. Further processing of pyruvate depends on the aerobic or anaerobic nature of an organism. In anaerobic respiration, pyruvate is further processed to produce either lactic acid or ethyl alcohol. There is incomplete oxidation of glucose in anaerobic respiration. In aerobic respiration, pyruvate is further processed to produce carbon dioxide and water; alongwith energy. There is complete oxidation of glucose in case of aerobic respiration. The scheme of glycolysis was given by Gustav Embden, Otto Meyerhof and J Parnas. Due to this, it is also called the EMP Pathway. Glycolysis takes place in the cytoplasm. Glucose undergoes partial oxidation in glycolysis; to form two molecules of pyruvic acid. Four molecules of pyruvic acid are formed after partial oxidation of one molecule of glucose during this process. First of all, glucose and fructose undergo phosphorylation to produce glucose-6-phosphate. The enzyme hexokinase facilitates this process. Two molecules of ATP are utilised during phosphorylation of one molecule of glucose. Two molecules of fructose-6-phosphate are formed at the end of this step. 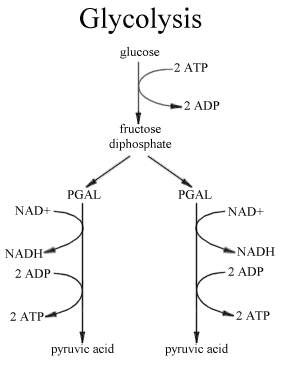 Fructose-6-phosphate is then converted into PGAL (Phosphoglyceraldehyde). Each molecule of PGAL then undergoes various steps to finally produce Pyruvic Acid. Four molecules of ATP are produced during this conversion. Since two molecules of ATP were utilised during phosphorylation of glucose, hence net production of ATP at the end of glycolysis is two for each molecule of glucose. Fate of Pyruvic Acid: Pyurvic acid further undergoes subsequent processes which are different for anaerobic and aerobic conditions. Endogenous electron acceptors are used for oxidation of organic compounds during fermentation. This is in contrast to aerobic respiration in which exogenous electron acceptors are used. Anaerobic does not necessarily mean absence of oxygen, rather it can also take place even in the presence of oxygen. Sugar is the most common substrate of fermentation. Ethanol, lactic acid and hydrogen are the common fermentation products. However, other compounds can also be produced by fermentation, e.g. butyric acid and acetone. Apart from taking place in yeast and many other anaerobes, fermentation also takes place in mammalian muscles. In our muscle cells, fermentation takes place during intense exercise; to meet out the excess demand of oxygen.